So there it sits in its resplendent beauty, your new G4 Tower. Its processing power is awe-inspiring, its storage gargantuan, its graphics stunning and vibrant. The keyboard is a delight for the typist, the optical mouse, like a clear bar of soap, elegant and precise. In the corner on a battered oak desk sits a yellowed Mac Quadra 650 with its little monitor and enormous "surfboard" keyboard, and an ovoid mechanical mouse. All these years it has served faithfully, growing a little from time to time with small additions of RAM and upgraded software, until the day came that the tasks you had in mind were beyond its capabilities. So today you face the dilemma that many have faced: how do you transfer your data files and documents, and maybe some applications as well, from your old Mac to your new one? 1. Stacks of floppies, Zip disks, CD-Rs, or other media. 1. What do you intend to do with your old Mac? If you intend to keep your old Mac in operation, it may make sense to add components to it, for example, networking parts. If you intend to give it to a friend or donate it to the WAP Recycling Program, it makes more sense to add components to your new system. 2. How much money -- and how much time -- do you have available for the project? The answer to this question is usually a tradeoff. For example, if money is very tight, but plenty of time is available, you can email the files to yourself, or use stacks of floppy disks like a PC user would. 3. What methods are open to you, given the type of old Mac you have? If your old Mac has the 1.4 megabyte floppy drive once known as the Superdrive, you can use the stack-o'-floppies method. Just buy a USB floppy drive for your new Mac, make floppies, and read them in. The VST drive I have only works under Mac OS 9, not in X's Classic mode. If you have a Mac Plus with low-density drives, the stack o'floppies method is the only way, and you''ll need another machine to copy the disks to high density, unless you can find a USB floppy drive that reads low-density disks. Mine doesn't. Most Macs can use the Ethernet method, however, which is a lot easier and faster, and usually cheaper. If you have a Mac SE, LC, or similar model with Ethernet, you can connect the machines with a reversed 10BaseT cable. If the machine doesn't have the Ethernet card, you may wish to see if you can find a card for it inexpensively. If you have a Quadra or Centris machine, or an earlier Power Mac, most of these have an Ethernet port called an "AAUI". It looks like a tiny Centronics port, about half an inch long, with a symbol near it that looks like this: <•••> (Note: the dot in the middle is option-8.) Many PowerBooks also have the AAUI port. To interface this port to 10BaseT Ethernet, you need a gizmo called an AAUI 10BaseT Transceiver. These are available very cheaply on the used market. The Centris 610 uses a small Ethernet card identical to that used in the LC-III. These cards are also available inexpensively on the used market. The Mac II series does not have built-in networking. You can look for a NuBus Ethernet card; many are available on the used market. Lastly, there are some PCI machines that apparently don't have AAUI ports. For these, you will have to locate a PCI Ethernet board which comes with Mac drivers. It won't do much good to get one-dollar PC clone cards at a flea market. Remember that it only makes sense to buy parts for the old Mac if you intend to keep the machine, or if your time is very valuable. If you do intend to keep your old Mac, or to pass it on to a child or significant other dwelling in your domicile, it is an investment that will repay itself beyond the initial transfer of files. You will be able to share printers, share a high-speed Internet connection, and even play multiplayer games. If you're using the stack o'floppies method, you may skip the rest of this article. You certainly have a lot of work to do, so the sooner you get started, the better. I do suggest disregarding any ideas of using Disk Doubler, MacZip, Stuffit, or any other approach to save disks. They'll waste far more time than they are worth. Of course if you can use Zip disks on the old machine, go ahead and get a USB Zip drive for the new one. And if you can write CDs on the old machine, go ahead and do that. Using Zips or CDs has the side benefit of producing a backup as you transfer, which is a very good thing. Once you have 10baseT ports on both computers, you can either connect them with a single pair-swapped patch cable, or you can use two "straight" patch cables and a hub. I have seen the pair-swapped cables at Best Buy, hanging right next to the straight ones. Make sure you get the right kind. Plug all the cables together. If you use a hub, hubs usually show green lights when there is a good connection. On the new Mac, open the File Sharing control panel. It has three tabs at the top. On the first page is a button labeled "Start." Click this to start file sharing. Starting file sharing will take a while. While file sharing is starting up, think about this. You can transfer files as a Guest or as a Registered User. The former is slightly easier, but has some restrictions. If you want to be able to transfer files as Guest, you will need to enable the Guest user on the new Mac. The File Sharing Control Panel allows you to specify the owner of the computer, a machine password, and give a network name to the computer, as well as turn File Sharing on and off. To enable the Guest user, click the "Users and Groups" tab. You'll see two names, one the "Machine Owner," usually someone you never heard of -- "Richard Rodman," in my case -- and the other, "Guest." Double-click on the "Guest" and you'll see a dialog with a button in the middle that has up and down arrows on one end. That button is called a "pop-up button," when you click the arrows it changes values, sort of like a pull-down but without pulling down. Anyway, switch it to "Sharing" and two checkboxes appear. Check the checkbox that is labeled "Allow guests to connect to this computer." Then click OK to close the dialog. Wait for File Sharing to finish starting. It will take about a minute, or more. Now, close the File Sharing control panel and open your hard drive icon. Create a new folder. You may call it "Sharing", or "Rick Rodman's Shared Folder" or something like that. Under Finder's menu, Get Info leads to a little menu, General Information and Sharing, when you have a folder selected. Make sure your new folder is selected and go to the Sharing menu item. A dialog appears with a checkbox and some security-related items. 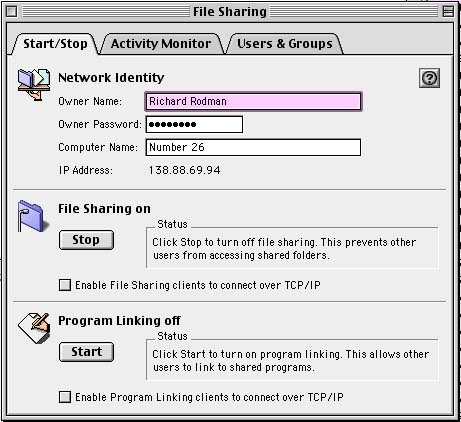 The Users & Groups panel, part of the File Sharing Control Panel in Mac OS 9, allows you to create lists of users who can share files across the network with a machine and assign them passwords. First, click the checkbox "Share this folder and its contents". Then, examine the security-related items. You'll see a line for the Machine Owner, "Richard Rodman" in my case, a line for a selectable "User/Group", and a line for "Everyone". The Everyone line refers to Guest. If you want to use Guest, click on the graphical "pop-up button" and select "Read/Write." This one actually works sort of like a drop-down. An eyeglasses-and-pencil icon should now show next to Everyone. Click OK to close the dialog. Your folder icon now has an ugly wire hanging off it. That means the folder is shared. Go to the old Mac and open the Chooser. Click the Appleshare icon. Over on the right, in the box now labeled "Select a File Server," you should see the name of your new Mac, "number26" in my case. Click it to select it, then click OK. A series of two dialogs will follow. The second dialog says, "Select the items you want to use." If you connect as Guest, you'll see the name of your shared folder as the only item. If you connect as the Machine Owner, you get a surprise - you see the name of the entire hard drive! Yes, as the Machine Owner, you can see the whole machine, not just the shared folder. I'm not even sure whether you have to create a shared folder at all. There is also a checkbox to reopen this folder every time you start up your Mac; don't check that. Once you click OK, an icon appears on your desktop for the shared folder or drive. Open it and copy all the files you like, in either direction. When you're done transferring, drag the icon to the trash. I do recommend that you make backups of the files transferred before you erase them from the old Mac. And while I'm recommending things, here's a nifty system extension that lets you open Joliet-style CD-ROMs on your Mac: http://www.tempel.org/joliet/. It works perfectly. If you're passing your old Mac on to another member of your household, you should probably set up usernames and passwords for each person, with shared folders and permissions set appropriately, so that you can share things and keep other things private. Make your wiring more permanent, so that you aren't tripping over cables. Buy a small UPS for each machine. A Mac network is easy to administer -- it'll take very little of your time, yet add much convenience and pleasure to your life.